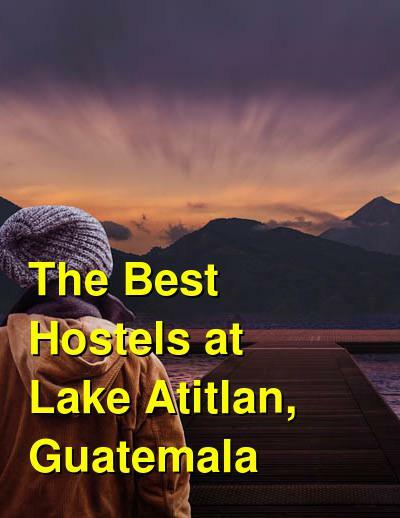 Lake Atitlan and its surrounding towns have become popular with travelers due to the beautiful scenery, swimming and watersports, and local Mayan culture. The different towns each have their own vibe. Some are for partying, some are for relaxing, and some are for history and culture. The hostels are also diverse, so check out these recommended places to stay and find something that is perfect for your trip! It seems like the Iguana has been around forever, and it offers something for everyone. First, the rooms are varied in both price and level of luxury. They offer dorms with shared bathrooms, all the way up to nice private ensuite rooms for (gasp!) older clientele who are also interested in the social aspects of hostels. While they are not a party hostel per se, on some evenings things do get busy as they have costume parties, a bar and restaurant, and live music. They specifically do not offer Wi-Fi, because they highly encourage guests to get out, mingle, socialize, and enjoy the social aspects of the establishment and the surrounding sights and activities. After all, you can hike, swim, scuba dive, engage with locals in small villages, and more. Isn't that why you came? They have hot showers, pool table and games, TV, internet (but not Wi-Fi), and an onsite bar and restaurant. They receive rave reviews from guests, and always have! This self-described party hostel sits right next to the lake and lets you jump straight off of their deck into the water. With great views of the lake and surrounding mountains from almost every room, you'll be in awe of the scenery as you mix and mingle with all of your new friends. Standard hostel amenities are available such as lockers, Wi-Fi, an onsite restaurant and bar, game room, TV, hot showers, tour book and transportation options, and free parking if needed. They have dorms and a variety of private rooms, too. Evening activities are planned for various nights of the week, all revolving around the bar and having a great time while the music plays. The Mikaso has dorms and private rooms available at a variety of price ranges and with differing amenities (ensuite vs. share bath, lake view or no view). They are known to be a relaxing, quiet, family-friendly hotel/hostel with great food at their onsite restaurant and bar. With a large and spacious deck, a hot tub, hot showers, pool table, Wi-Fi, laundry, and more, they offer everything a traveler could need or want. A shared kitchen is also available for self-catering. The overall vibe a the Mikaso focuses on the great activities around the lake. The staff can help you plan your stay and book tours and excursions to the various towns. Hiking, swimming, and scuba diving are just a few of the options. Guest reviews highlight the views, the cleanliness of the rooms, the food, and the friendly staff.